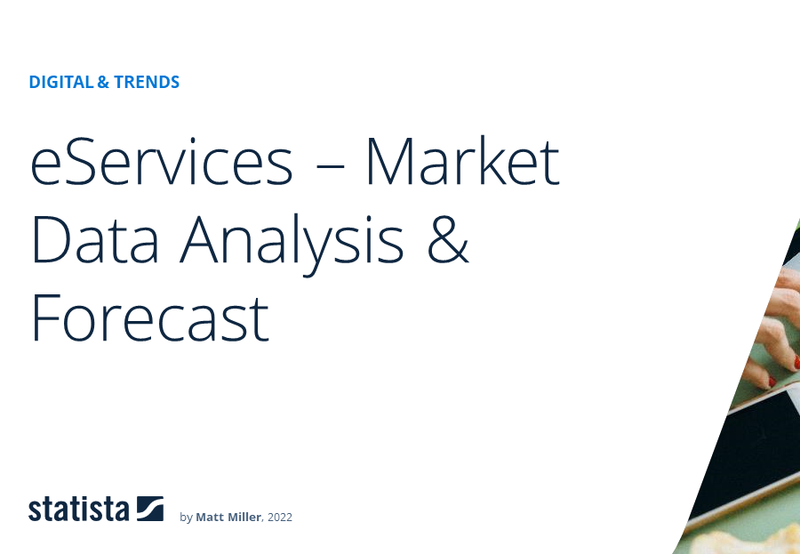 Revenue in the eServices market amounts to US$38,532m in 2019. Revenue is expected to show an annual growth rate (CAGR 2019-2023) of 9.3%, resulting in a market volume of US$54,894m by 2023. The market's largest segment is Event Tickets with a market volume of US$19,944m in 2019. In global comparison, most revenue is generated in United States (US$55,734m in 2019). The eServices market is defined by the sale of online services and digital goods via the internet. The definition includes event tickets (sport events, music events and cinema tickets), fitness apps and wearables, dating services (matchmaking, online dating, casual dating) as well as online food delivery (restaurant-to-consumer and platform-to-consumer delivery). The ticket reservation or purchase can be completed on a desktop PC or via mobile devices (smartphones or tablets). The definition of eServices does not include: media content acquired online (see: Digital Media) or the online sale of physical goods (see: eCommerce). Furthermore, no business-to-business segments are included, neither are revenues from online gambling, software downloads and services, or commission fees of price/product comparison sites. Reading Support Revenue in the eServices market amounts to US$38,532m in 2019. Reading Support The Online Food Delivery segment is expected to show a revenue growth of 14.0% in 2020. Reading Support In the Online Food Delivery segment, the number of users is expected to amount to 215.1m by 2023. Reading Support User penetration in the Online Food Delivery segment is at 21.8% in 2019. Reading Support The average revenue per user (ARPU) in the Online Food Delivery segment amounts to US$94.71 in 2019. Reading Support With a market volume of US$55,734m in 2019, most revenue is generated in United States. Here you can find more studies and statistics about "eServices".